Back in December this a picture of Peyton Manning went viral. The Business Insider picked up on this and wrote about Manning’s preparation. As the Denver Broncos now prepare to play in Super Bowl, it seems even more appropriate to discuss. Not that winning or losing the game was all on Peyton Manning’s preparation, but his preparation and commitment to doing his best helped the rest of the team and coaching staff prepare. Recently, someone said that Peyton would question the planning of even the coaches to make sure he and all had prepared properly leaving nothing to chance or hope, rather to execution on the field. What are you and I doing to prepare? For many of us presentation is often overrated and preparation underrated. We want to do something but do not want to pay the price to get ready to do it. We think that we can somehow just ride the wave. Some people are incredibly talented, but it doesn’t get them to where they need to be. They may ride this talent for a while, but somewhere along the line you and I will be outdone by someone who has worked harder in preparation. We all have to prepare. Prepare for what? It doesn’t matter if it is for an athletic achievement or academic accomplishment, preparation is the perspiration behind the presentation. To be the best, to succeed, to do what we need to do, preparation is the critical component for our lives. Peyton Manning should be an encouragement to many of us to spur us on. His ability is evident, but it is preparation that causes many to consider him the greatest quarterback of all time. We don’t have to like football to learn from him. Football just happens to be his focus and ability. What is yours? Whatever we are after in life, we are learning more and more it is the preparation that moves us from where we are to where we know we can be and become. What areas of life do you need to prepare more intently? 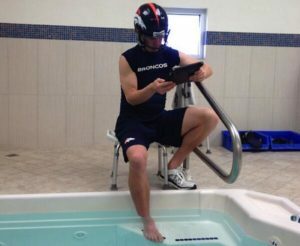 Are you willing to work hard and even look silly with a helmet on your head while your foot is in the water? What goals do you have? What dreams are still inside you? What preparation needs to happen for the next test at school or presentation at work or physical challenge you have set before you? Whatever it is, don’t allow the lack of preparation be your downfall. Learn from Peyton Manning and even the best of us must prepare to become all God designed and desires for us. What needs to happen in preparation to achieve the goal or build the relationship? How will your preparation inspire others to do the same?